As we know that mobile devices come with mostly two operating systems and that is Android and iOS. Now developing an application for the android and iOS devices are kind of messy. We need different code, design and development plan. Which makes it costlier and increase maintenance cost. This is not true if you are developing an application using cross-platform technologies. With native mobile application development, we need different code and a different stack of technologies to work on. Here, we require multiple resources for development and for support and maintenance. One of the problems is that we need to push updates differently. For web, Android and iOS, we need only one code and a stack of technology to develop an application. This is one of the reasons why many companies opt for cross-platform as it allows them to save development time and cost-effective solutions. This doesn’t only add a plus point to your side but it also adds amazing functionality into the application for the users. To push an update, we have to write code only one time for different platforms. 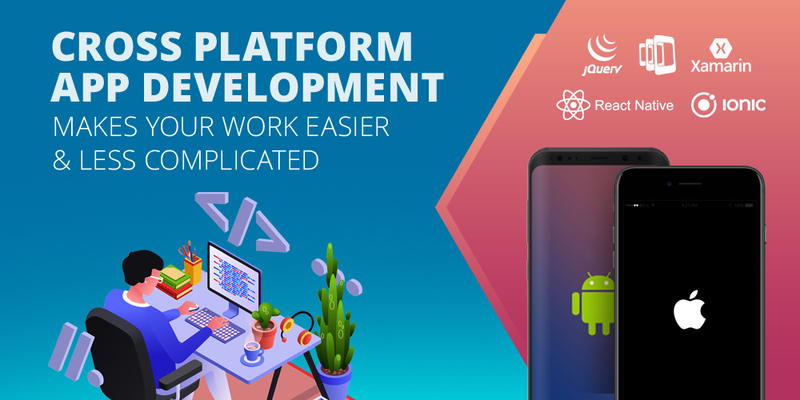 Obviously, cross-platform app development makes the work easier as well as decrease the cost of mobile application development. Here I am going to discuss some of the widely used cross platform for app development. This will help you to choose the best technology stack for your application. The secure and full of amazing features. The jQuery is built with Java technology. To make the UI more user-friendly and attractive, this framework comes with HTML5 framework. The Java and HTML5 make your application user-friendly and secure. Application developed with jQuery works on Windows, Android, iOS, blackberry, and many other browsers. The resources for jQuery are available at our demand so you don’t have to worry about the same. And the app development is very faster as it comes with inbuilt extensions. Ionic developers are available in bulk so whenever you are stuck at any point you can expect to get an immediate solution from the community. This framework comes with built-in plugins, features and functionalities which are very easy to use. To provide a seamless experience with the framework works with Angular technology. Support from the Microsoft community makes it easier for you to works on bugs and develop application faster. Xamarin Framework libraries help you to develop application better than ever. You can share the same code web, iOS, and Android. Due to a large community of developers, you can hire xamarin app developers at cheaper rates and you can also aspect the overall cost to be minimum. At the time of designing UI, you can aspect to use 90% of the same coding for different platforms. The integration is very easier with other platforms, so you don’t have to worry about losing data. No matter what application you are developing with what so ever technology stack or framework, all you have to keep in mind is the support from the community you are choosing good and meeting your needs. Another most important thing is to check the availability of the resources in the market at your cost. A part of all this, to develop mobile application faster set a fixed deadline and set a maximum time for testing before launching an application. All the framework are best, you have to choose as per your requirements.